The Global Volcanism Program has no activity reports for Mundua. The Global Volcanism Program has no Weekly Reports available for Mundua. The Global Volcanism Program has no Bulletin Reports available for Mundua. A cluster of basaltic volcanoes forms the Mundua Islands. The largest volcanic center is formed by the W tip of the 7-km-wide, linear Mundua Island and the arcuate Wingoru Island immediately to the W. The crater of this volcano is flooded by the sea through narrow channels on the N and S sides; remnants of crater walls form Wingoru island and are exposed at the W tip of Mundua island. Five small cones occupy the central and eastern sides of Mundua. Two of these have well-preserved craters and are of Holocene age (Johnson and Blake, 1972). The Global Volcanism Program is not aware of any Holocene eruptions from Mundua. If this volcano has had large eruptions (VEI >= 4) prior to 10,000 years ago, information might be found on the Mundua page in the LaMEVE (Large Magnitude Explosive Volcanic Eruptions) database, a part of the Volcano Global Risk Identification and Analysis Project (VOGRIPA). There is no Deformation History data available for Mundua. There is no Emissions History data available for Mundua. A cluster of basaltic volcanoes forms the Mundua Islands, north of New Britain. The largest volcanic center is formed by the western tip of the 7-km-wide, Mundua Island and the arcuate Wingoru Island immediately to the west (left of the large cloud banks at the SW side of Mundua). The crater of this volcano is flooded by the sea through narrow channels on the northern and southern sides. Small cones can be seen on the eastern side of Mundua. 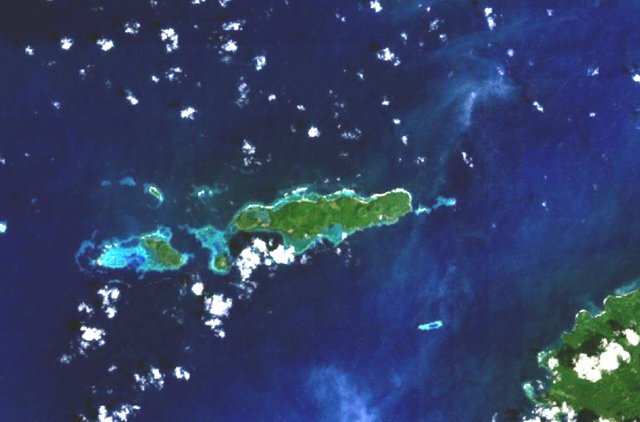 The western tip of Garove Island is visible at the lower right in this NASA Landsat image. Large Eruptions of Mundua Information about large Quaternary eruptions (VEI >= 4) is cataloged in the Large Magnitude Explosive Volcanic Eruptions (LaMEVE) database of the Volcano Global Risk Identification and Analysis Project (VOGRIPA).